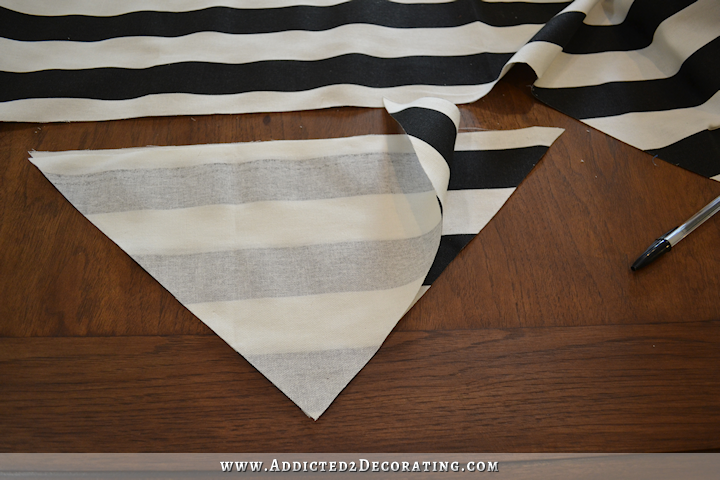 Remember that black and white striped fabric that I purchased for the dining room, and then decided not to use? Well, I decided to put some of it to use to make a couple of accent pillows for the chairs that will go in the entryway. And because I couldn’t visualize in my mind exactly what I wanted, I decided to make two different styles and then choose. Those were both made with the same fabric and the same process, but the different looks are achieved by placing the pattern onto the fabric in different directions. In order to make my pattern, I taped four sheets of printer paper together, and then cut it to the size I wanted my pillow, plus seam allowances. 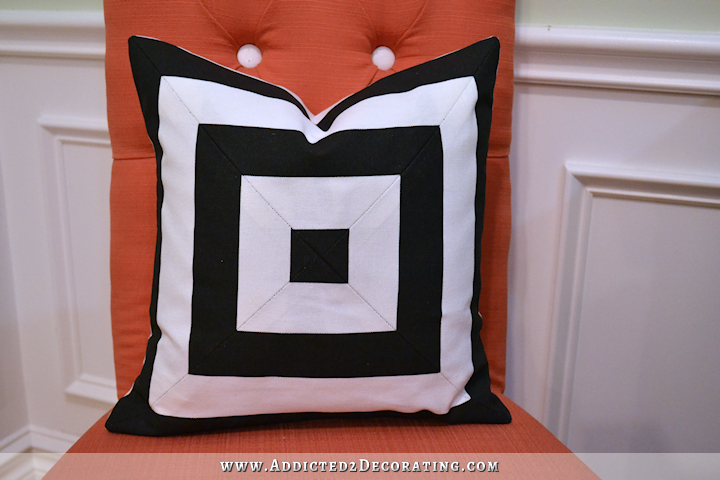 I wanted my pillow to be approximately 14″ square, so I cut my pattern to 16.5″ square. 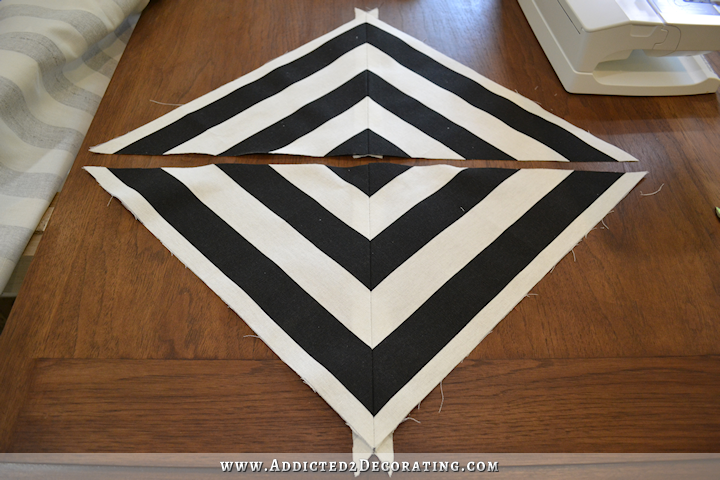 Then I folded the pattern in half diagonally, and then cut along the folded line. And then I did that one more time. 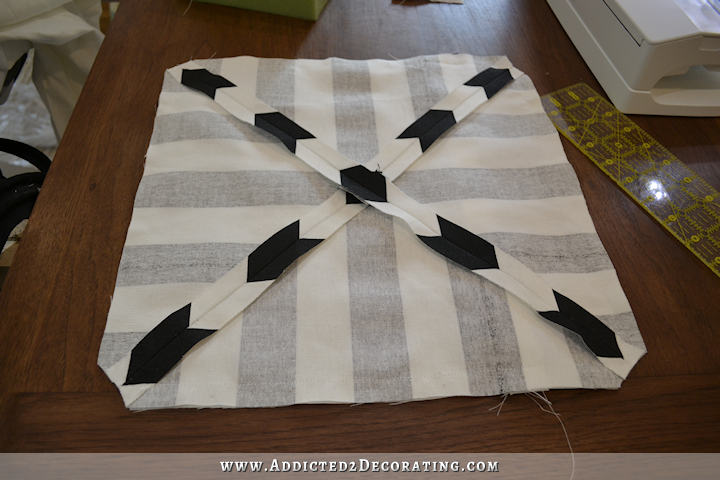 To make the pillow with the concentric squares, I placed the pattern onto the fabric so that the longest side was parallel with the stripes on the fabric. I wanted the black stripe along the outside of the pillow, so I scooted the pattern down into the white stripe 5/8″ to allow for a seam allowance. That way my stitching would be right along the edge of the black stripe. 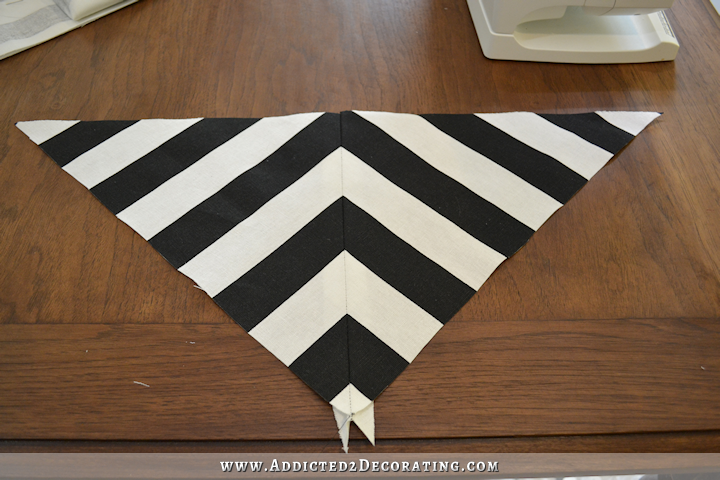 After cutting out four of those pieces exactly alike, I pinned them together two at a time, right sides together, and making sure that the stripes were lined up as perfectly as possible. Then I stitched along one of the short sides. I sewed two pieces together at a time, and pressed the seams open and flat. 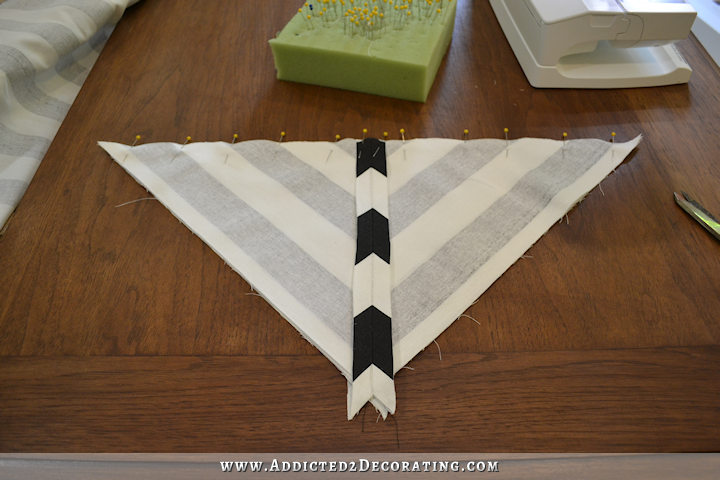 For the other design, I placed the pattern onto the fabric so that the longest side of the pattern was perpendicular to the strips on the fabric, and I made sure that the center of the pattern was perfectly centered on a strip. I cut out four identical pieces. And then I proceeded just like the other pillow, starting with sewing two pieces together at a time. And creating two halves. Then I pinned and sewed the two halves together, and pressed the seam open and flat. And this is how that pillow front looked. So with one fabric, I got two very different looks. The one on the top is with the longest side of the pattern placed perpendicular to the stripes, and the one on the bottom is with the longest side of the pattern placed parallel with the stripes. 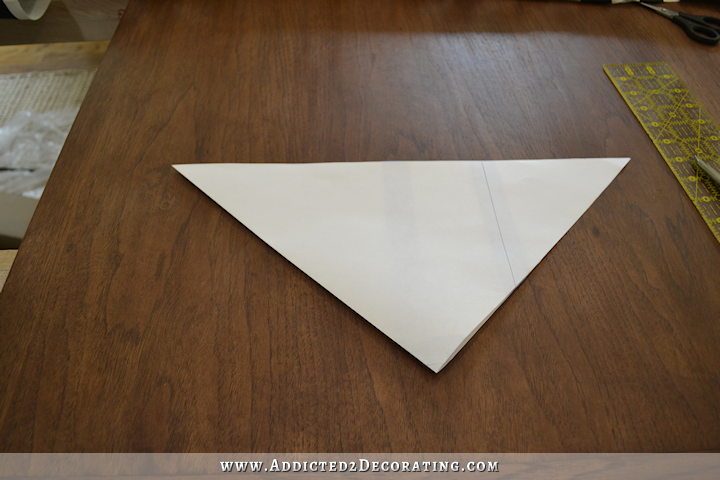 My favorite way to finish a pillow is with an envelope back. I used to put the opening right in the center of the back, but I’ve learned that it’s so much easier (especially with larger pillows) to get the pillow cover onto the pillow insert of the opening is offset. 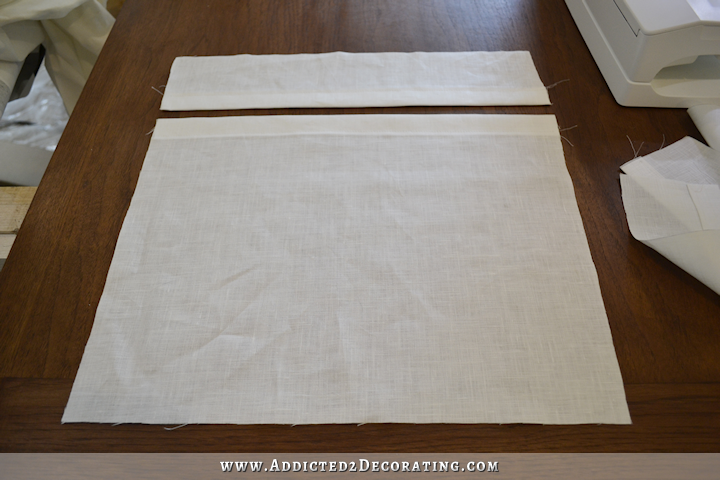 I cut the pieces to the same width as the pillow front, and then sew a double 1″ hem into each piece. 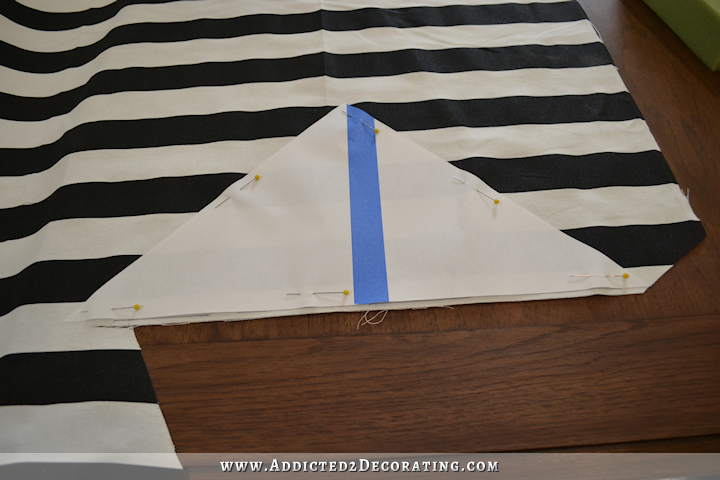 The I place them so that the hemmed sides are stacked, pin them together, and cut the height to match the height of the pillow front. 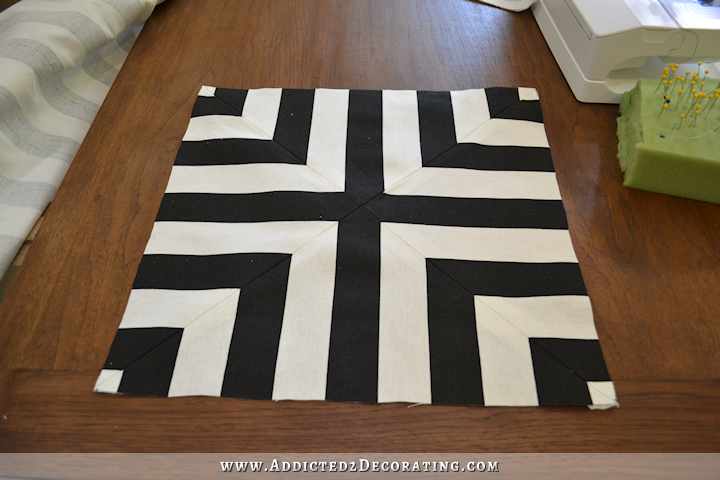 Then with right sides together, I pin the pillow front to the envelope back, and stitch together on all four sides. 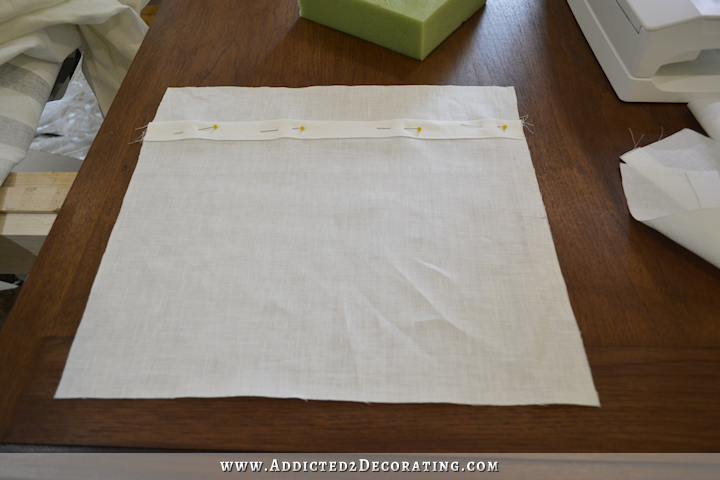 Before flipping the pillow cover right-side-out, I always trim the corners to reduce the bulk of the fabric in the corners. Then flip right-side-out, press the edges so that there are nice, crisp seams on the edges, and add the pillow insert. Since I’m not close to a store like IKEA that has really inexpensive feather pillow inserts, and since I often make non-standard pillow sizes, I like to make my own feather pillow inserts. You can see that tutorial here. And here’s how they turned out. 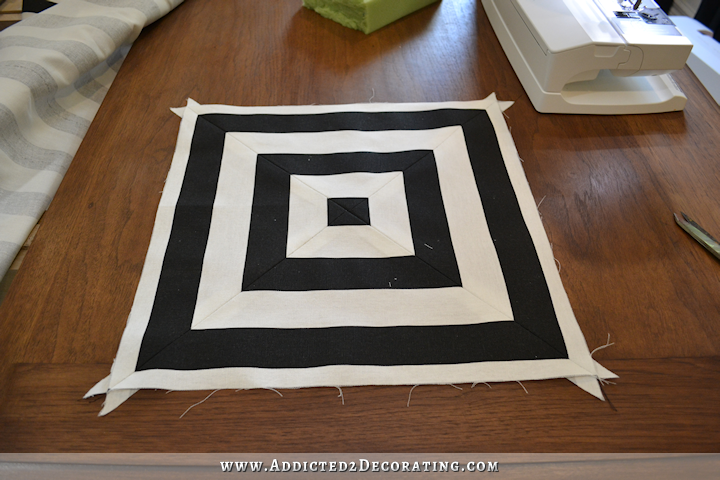 First up, the concentric square pillow. I like it, but I think this other one is my favorite. I think its because I already have so many rectangles in the room, so adding more doesn’t really appeal to me. The second one still gives me that graphic/geometric black and white look, but without more rectangles or squares. You are such a worker bee! They can be different; don’t have to match. Both look good. I like Laura’s idea about two sides. I love both of them, great job as usual. I would use one of these pillows on one of the chairs, and use the other pillow on the other chair. 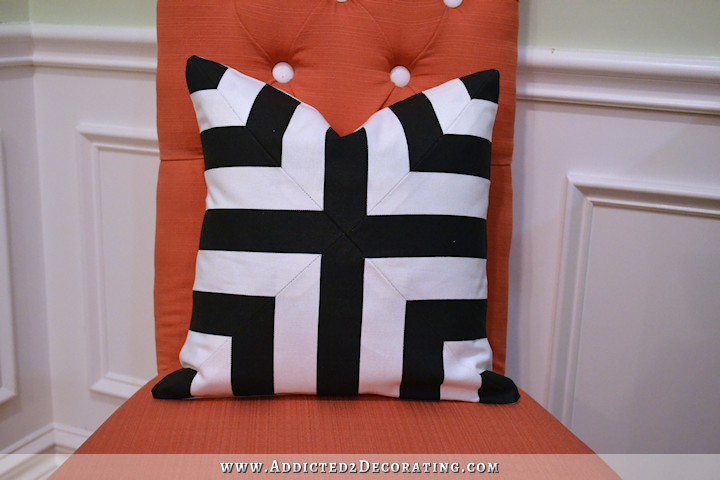 They are really cool looking pillows – I like them both – neat the way you cut the pattern too. I just wonder how a round white pillow with black piping and a black monogram would look. I actually have a very strong aversion to round pillows. 🙂 Just one of my many quirks. I do love the idea of having the pillows reversible so you can have both designs and change them whenever you want to. I agree with you, the second one is more interesting. I like the pillows very much but I think the chairs are better without them. I don’t like the black and white pillows on those chairs and thy are too big. I would use a half pillow out of the white fabric and put a monogram or something on them in black, if I thought I needed to bring in black, and maybe black piping. Chopping pillows is out I’ve heard. I don’t think “chopping” pillows is a fad. I think it’s a matter of personal taste. I just glanced through my latest issue of Traditional Home, and about half were chopped, and half were not. I’m not really concerned with what’s “out” and “in.” I like my pillows like that because I can’t stand the look of pillows looking perfectly rectangle and rigid, like little soldiers standing at attention. I too like both of them…and feel there’s no reason you can’t use both. Also like the idea above having a round pillow, but that would be difficult to achieve with geometric pattern, maybe. You don’t seem to be a karate chop kind of gal, but if it works for you, go for it. I like the pillows too. Very fun, fast project with high impact. That being said, these gorgeous pillows scream for attention. Beware the focus pull. Thank you for sharing your method! 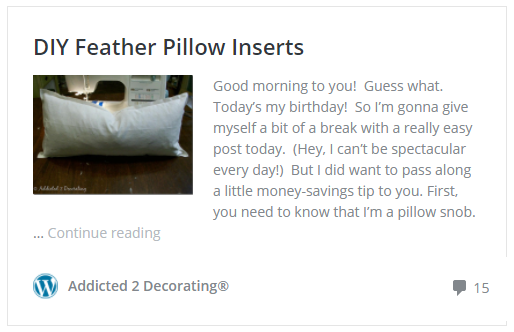 I am slightly embarrassed to say I have tried to make similar pillows and just couldn’t figure out how to make it work! I vote for one of each! They’re both beautiful patterns and I like when things aren’t always matching. Not that you want to make yet another pillow option, but what if you recreated the second option but rotated it about 45 degrees so that it made a large ‘x’ in front. It would still be geometric without making squares and could make the pillow look slightly larger even, if that matters. 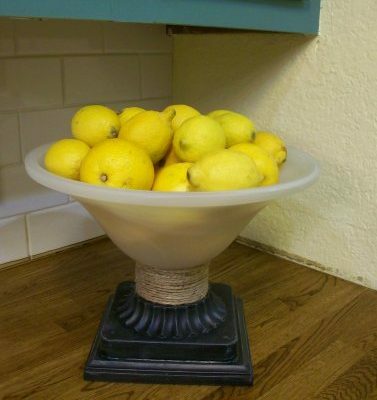 May also soften the angles without going ’round’. Can you explain how to do that please! Love the designs on both. I’d keep them both – no need for totally matchy. Some pretty good ideas on here. 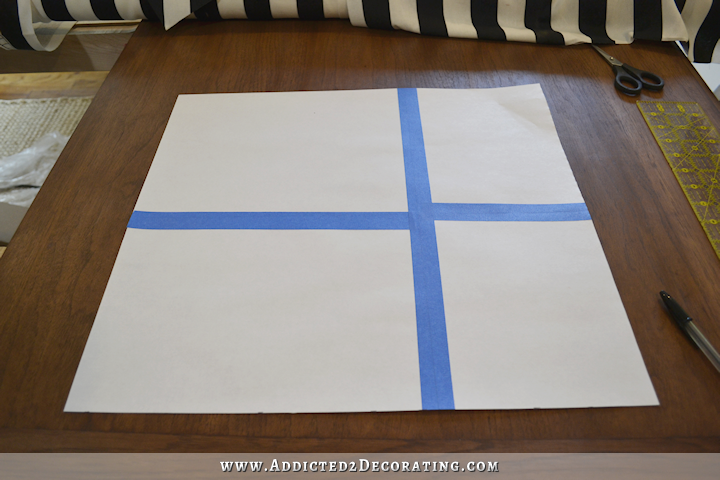 I would make the half pillow and either add piping or some silky tassels for the corners. But I like them all! Depends on personal style, of course! Thanks for the tut, I can never figure those things out. Love the pillows! Would love to see a picture that includes your gorgeous wall, the buffet and the two chairs with pillows – see the overall effect. Kristi, you are so talented! I think you could have been an engineer, the way you figure everything out! So impressed. Love both pillows, also love the additional ideas of back and front being one of each pattern, but that would preclude removing the pillows and your envelope backs. Wish I’d seen this before I made the pillows for the guest bed! Will be keeping this tutorial!! You are such a talent! Thanks so much for sharing it with us all. 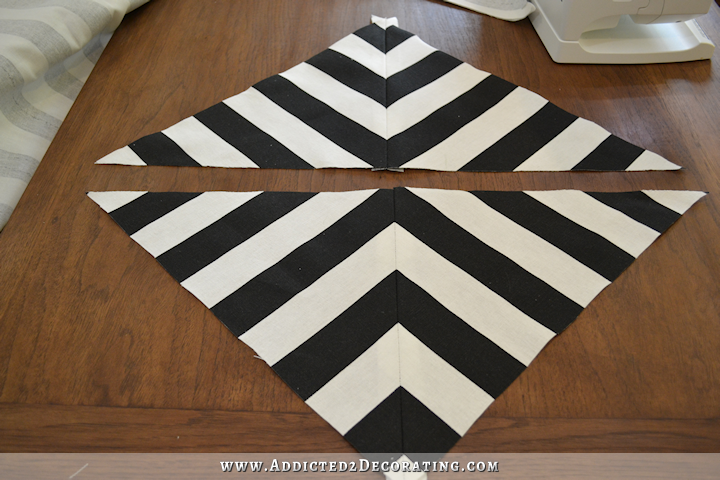 You are so creative in working out those 2 different designs with the striped fabric. Thanks for the step by step guide to do that. Whilst I really love both designs, it’s hard to choose, as I like them both equally. I was also thinking if could you make the design reversible, so you could change the look to which design appeals to your taste each day/week? Also would it be difficult to change the + design to a X design? I think a X design pattern would look amazing too IMHO. I like that you’ve done a fun creative project and so excited that your entryway is getting so close to completion now. ha ha, I prefer the one on the right, but both are really good. You’ve matched up your lines perfectly and they’re so crisp! I think the black and white combo against the coral is striking. 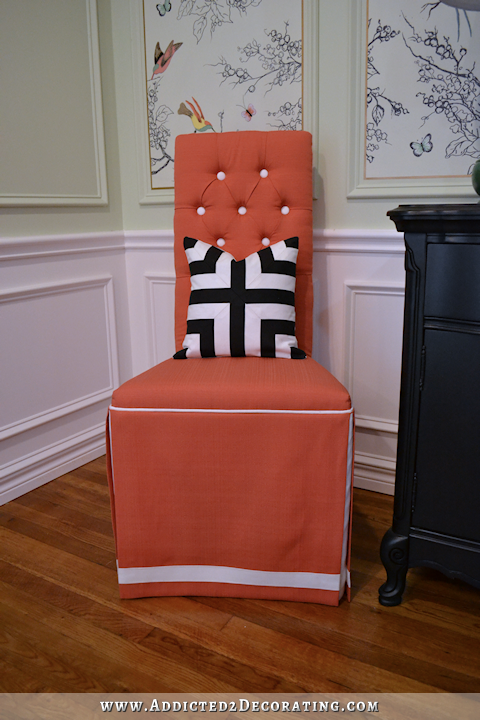 You really have a great eye for color and pattern! 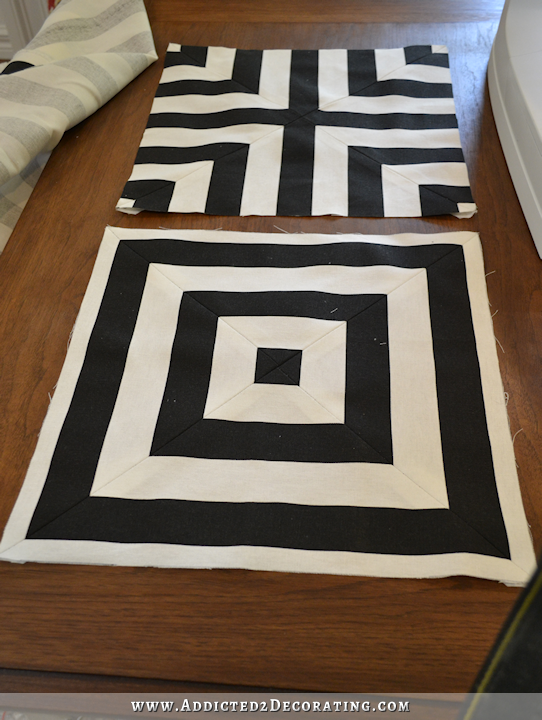 Perfect timing….I just walked in with three different fabrics to try my hand at pillows! Thanks for the tutorial! I like the 2nd one better also. And thanks for the tip about the envelope back. I am planning to make one today but your back makes more sense than the one I was going to do. I hate having to fight to stuff the pillow in, lol. 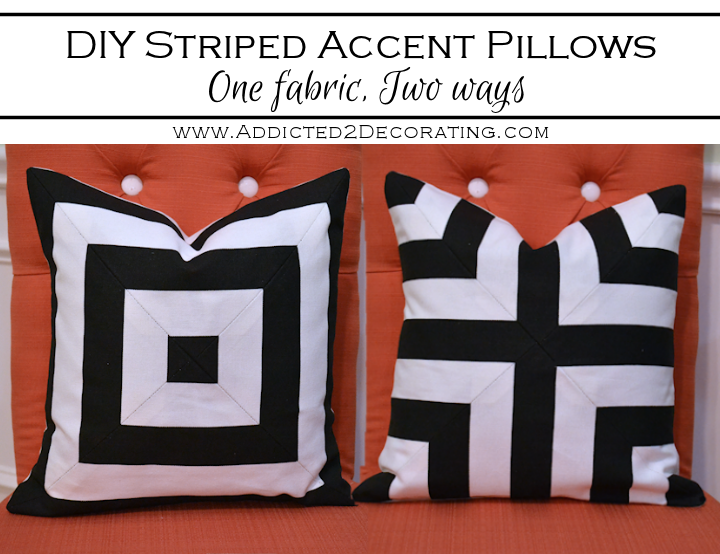 I like the pillow on the left with the squares. It’s easier on the eyes. The one on the right is cute but looks too busy. Nice! I’ve done this kind of strip play before, but have to admit it takes me a few minutes of turning things every which way before I remember how to achieve the different looks. Do you do any closures in the back or do you find the overlap (1″ I think?) to be sufficient for keeping it closed? So funny, but I made one like your favorite a few years back. I had some scraps from something else I made that happened to make the perfect triangles, so I played around with the direction and ended with the same design! I was concerned the pattern would somehow shift when I inserted the pillow, so I backed the design with some stabilizer. It’s my favorite pillow in my whole house, I just wish I had more of those scraps to make two. :-/ Love those happy discoveries! BTW, I missed wishing you Happy Birthday a few days ago….hoping you had a nice day! Happy Birthday a bit late! *Im surprised a tv network hasn’t picked you up yet! I don’t often disagree with you, especially after you explain your choices, but this time I really prefer the pillow on the left. I think it is because the other option reminds me of the British flag. While I have no negative reaction to their flag, it somehow looks harsh or jolting when viewed on the pillow. I think the other design with the squares is more calming to my personal senses. 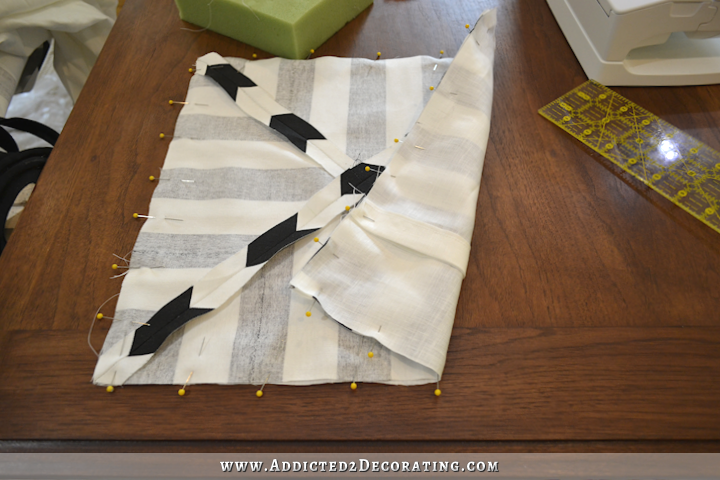 I love this method of making pillows with striped fabric, and I think it is complimentary to your room, I’m just not sure of your pattern choice. I’m sure after I see it in the context of the rest of the space, whatever pattern you choose, will be lovely. Mitzi, It is so funny you said that about the British flag. I love both pillows but that was my first thought about that one too!! 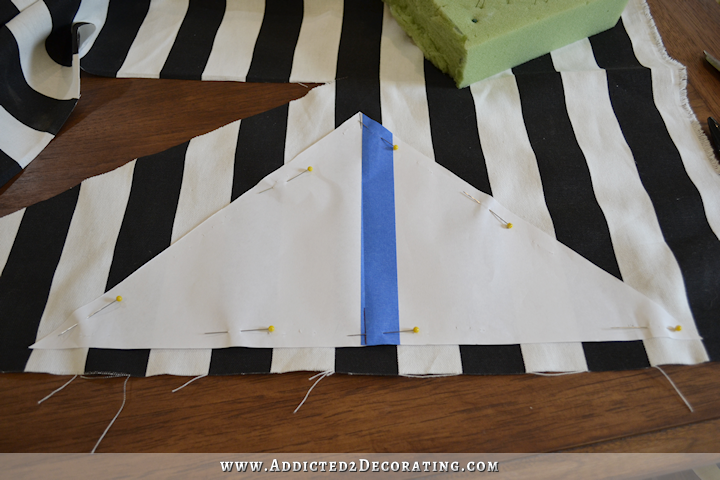 I always like learning a new take on things..
How about doing just striped pillows to echo the striped draperies? 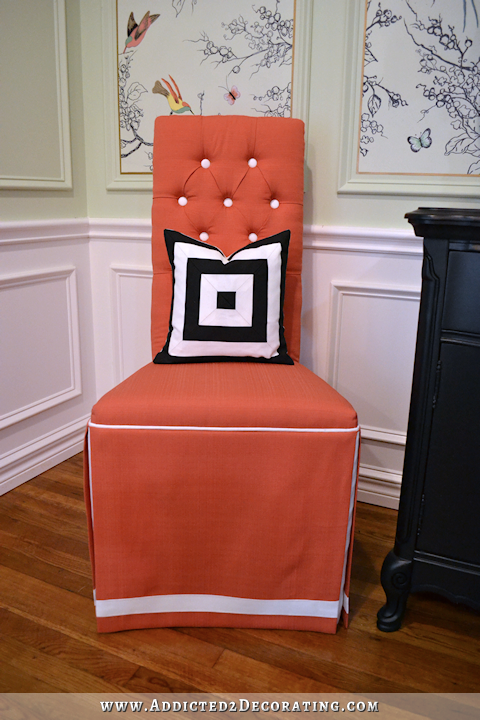 Love the pillow, and the completed chair! I must say, when you first bought that dining set, I couldn’t imagine what it was that you saw in it, or would make of it. It’s a complete transformation! Amazing. I also like the one on the right more! Years ago, I created pillow covers for a bunch of old mismatched pillows. I made the envelope backs, based on what a pillow sham looks like. They worked out well, but are now all ready for the trash can. When I do this again, I will make sure to offset the backs- that makes sense! 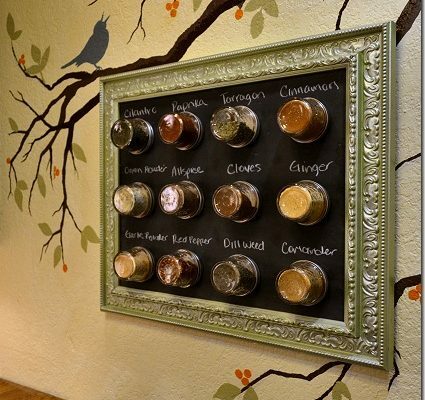 What a clever do-it-yourself idea. I love those pillows and love the two together. 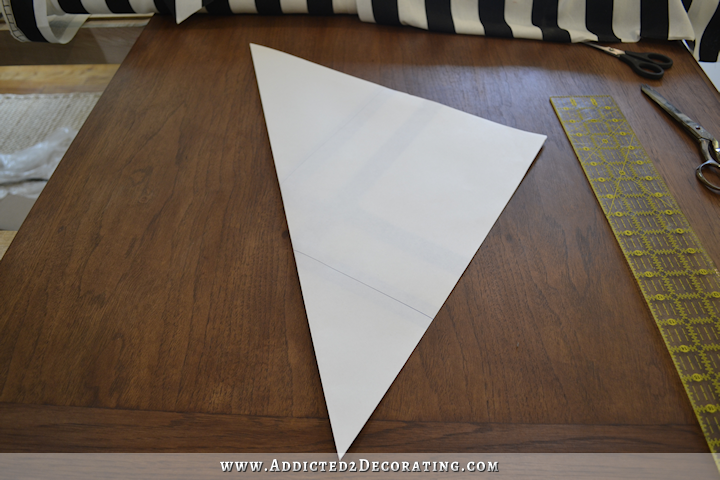 This looks like a fun project and you could do with many types of patterns. Swapping out your pillows is an easy way to change your décor, as long as you find styles and colors that match your furniture. In fact, if you know that you will want to change your throw pillows regularly, consider buying furniture in neutral colors. 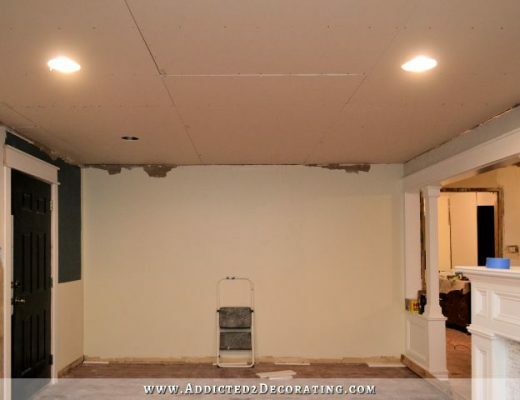 This will allow you to change the colors and fabrics as you see fit.